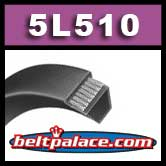 5L510 FHP V-Belt | Light Duty 5L-510 V Belt, Consumer Brand. Home > Light Duty V Belts > FHP V Belts. 2L through 5L Sections... > 5L Light Duty V-Belts (FHP) 5L Sections - CLICK HERE! > 5L510 FHP V-Belt. Consumer Brand. 5L510 FHP V-Belt. Consumer Brand. 5L510 FHP V-Belt. 5/8” W x 51" Overall Length. Consumer Brand. Classical B48 V-Belt on light duty applications. B48 POWER KING V-BELT. 21/32" W X 51" Length. 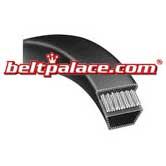 Replaces: Aaon Belt B-48, R38090. Standard FHP 5L510 Belts.